In order to get users to log time every day (or within certain intervals) and to help them remember to report time, a reminder can be enabled. It can be enabled by an administrator and is affected by the workday length setting. 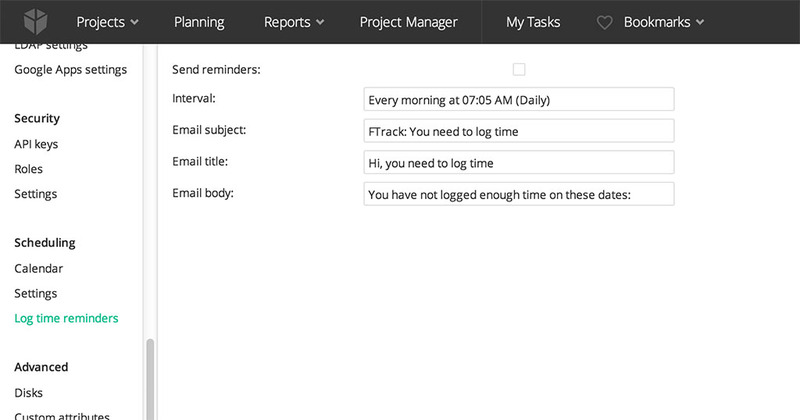 Go to System settings ‣ Scheduling ‣ Log time reminders. Set Send reminders to On. Select within which interval you want the reminders to be sent. If you don’t want the default settings for subject, title and body to be used in the email that is sent, you can change them now. ftrack won’t send reminders to users who doesn’t log time.